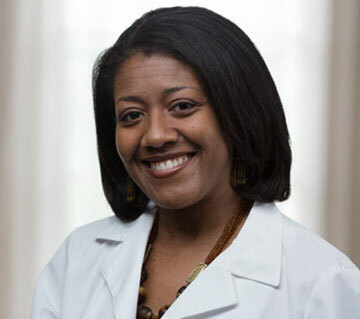 Dr. Amina White is a board-certified obstetrician-gynecologist and bioethicist. She joined the faculty of UNC Chapel Hill in September 2015 and is an Associate Professor in the Department of Obstetrics and Gynecology. Dr. White’s interests include managing normal and high-risk pregnancies, treating abnormal uterine bleeding, and the applications of fertility awareness. She is committed to providing evidence-based, compassionate, and comprehensive care for the whole patient. In her previous work in the Clinical Center Department of Bioethics at the National Institutes of Health (NIH), Dr. White studied ethical challenges that physicians face during training and in clinical practice when caring for vulnerable patient populations. Her research has included topics such as patient-physician communication in the era of electronic health records, patient engagement and empowerment of disadvantaged or marginalized patient groups, and trauma-informed practices in obstetrics and gynecology for women who disclose a past history of abuse. In addition, her research has explored the ethics of certain regulatory barriers that restrict pregnant women from participating in many clinical trials. At Reply, she hopes to study not only the clinical applications of fertility awareness, but also the ways in which fertility awareness patient education may serve to empower women who wish to learn about it. Dr. White grew up in Arlington, Texas. She attended Yale University and Harvard Medical School, and completed her OB/GYN residency training at Georgetown University Hospital. Following residency, she joined the faculty at Howard University as an Assistant Professor of Obstetrics and Gynecology where she was in practice for four years. During that time, Dr. White obtained a Master’s Degree in Liberal Studies with a concentration in Ethics and the Professions from Georgetown University. She later went on to complete a postdoctoral fellowship in the Department of Bioethics at the NIH. Dr. White and her husband are excited to be in North Carolina, and she is honored to join the Reply practice.